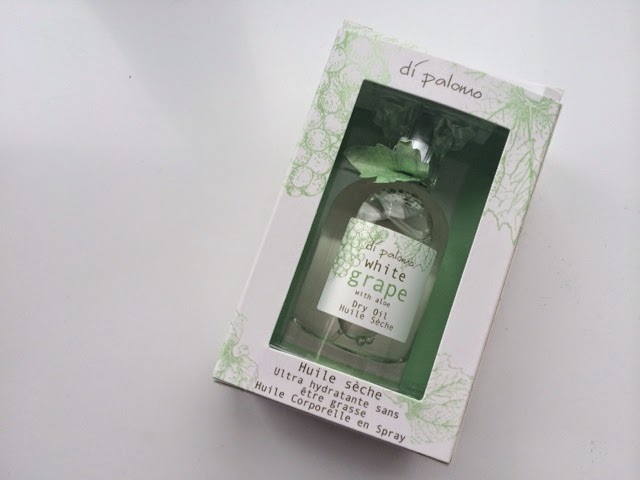 I was sent this item by the lovely people at Di Palomo, they have four different ranges including Tuscan Rose, Wild Fig & Grape, Orange Blossom with Wild Honey & Olive. Each range have a number of different products including Fragrances, Cleansing Bars, Body Butter, Lip Balms, Hand Cream and Gift Sets ranging from £4.00- £25.00. I was sent the White Grape & Aloe Dry Oil, I had never used a dry oil before but after using this I think will be from now on wards. This comes in a spray form and is perfect for when you just get out the shower to allow this mist to absorb into your skin and leave a fresh fragrant smell, I usually find alot of smells are too strong for me but I think this has the perfect subtle, fresh and light smell. This also contains vitamin E which is an added bonus! I've heard that dry oils are good to use on your hair to give a glossy finish so am definitely going to try this. Overall I would recommend this to anyone and at £18.00 I think this is a very reasonable price for a 50ml bottle. Have you ever tried a dry oil? 1 comment on "Di Palomo"